Originally this was a commission I designed for a baby's nursery, whose walls were painted with clouds. They asked for birds to feature on it, so I drew my favourites, swallows. I love watching the swallows out of my kitchen windows, swooping over the canal, looking like they are having such fun. If I could come back in another life, I think I would like to be a swallow! I was really pleased with the result. So, when the customer came to collect it, I was really disappointed to see it go. 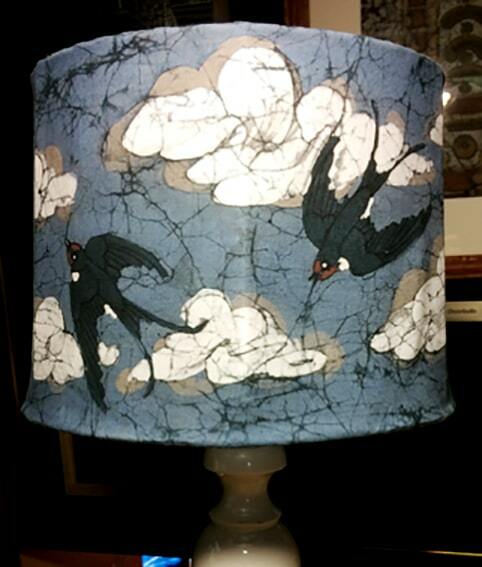 I always keep the working drawings for all my lampshades, so I decided to make another one for the Gallery.